An emergency blood drive is being organized by the North Brooklyn Chamber to help the NY Blood Center meet the needs of their patients during an ongoing shortage. 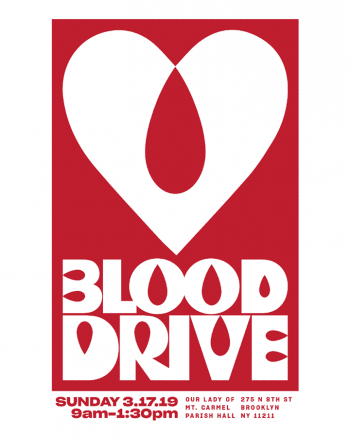 The blood drive takes place Sunday, March 17, at Our Lady of Mt Carmel Church, (275 N. 8th St.) from 9 a.m. to 1:30 p.m.; donors can signup for an appointment here if they can’t make it this Sunday. Four weeks ago, the New York Blood Center announced a blood emergency because donations had been lagging through the month of January. O- and B- inventories have not recovered. O- is the most needed blood type, transfusable to all other blood types and most urgently needed. 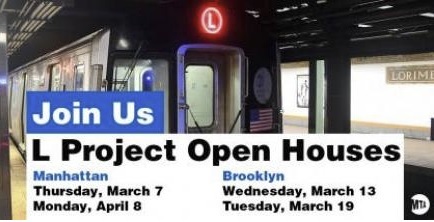 The MTA is hosting its second L train open house tomorrow (3/13) at the Williamsburg Northside School (299 N. 7th St.) from 6 p.m. – 8 p.m.
Two additional L train open house sessions are scheduled for Tuesday, March 19: Grand Street Campus High School, (850 Grand St.), and on Monday, April 8: (14th St. Y), 344 E 14 St. 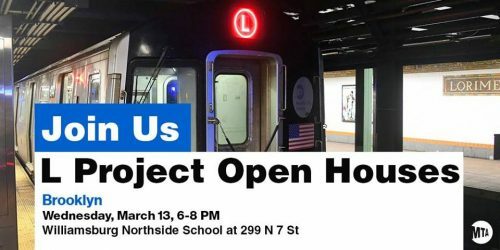 The MTA is hosting the first of four open houses focused on the L train tonight (3/7) at Our Lady of Guadalupe St. Bernard at 328 W 14 St. in Manhattan from 6 p.m. to 8 p.m.
Wednesday, March 13: Williamsburg Northside School, 299 N 7th St.
Tuesday, March 19: Grand Street Campus High School, 850 Grand St.
Monday, April 8: 14th St Y, 344 E 14 St.
Renderings of two additional Greenpoint Landing mixed-use towers with 745 rental units (30 percent ‘affordable’) were released today resembling a “ziggurat and its inverse,” Curbed reports. This is Brooklyn’s first development from the architectural firm OMA (founded by the esteemed Rem Koolhaas), who is also behind the McKinsey & Company Hong Kong office, the Shenzhen Stock Exchange, and the redevelopment of the Miami Beach Convention Center, among dozens of other “world-class” buildings. 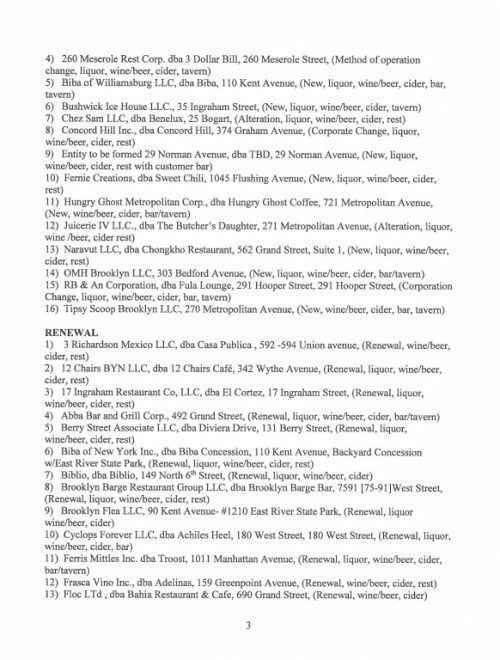 A lot of local history is quickly disappearing, but one place that is holding strong is Brooklyn Label (180 Franklin St.) and the historic building it calls home. French Greenpointer Robert Arbor, proprietor of Le Gamin (108 Franklin St.) re-opened Brooklyn Label in the historic Astral Building. The former management did little to recognize the amazing history of the space, something that Arbor has dedicated himself to changing. 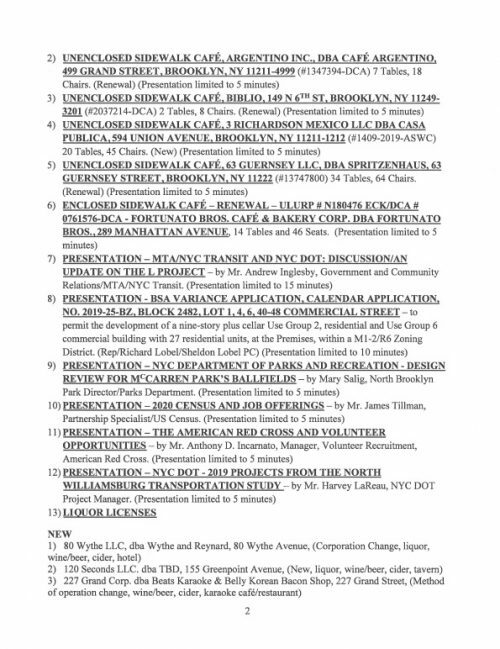 The Astral Apartments are not only landmarked, but the building is also on the National Register of Historic Places. 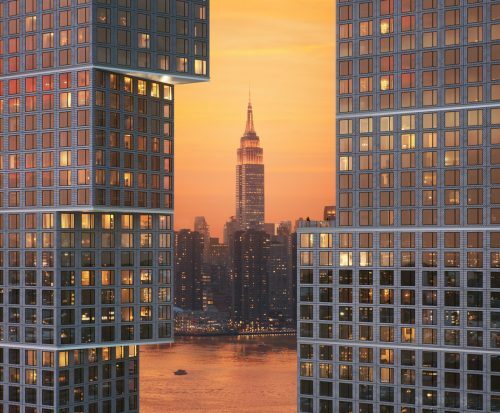 Arbor and his manager, Alex Russell, are determined to honor the building’s rich history and its patron philanthropist Charles Pratt, the oil baron and the richest man in 19th century Brooklyn. 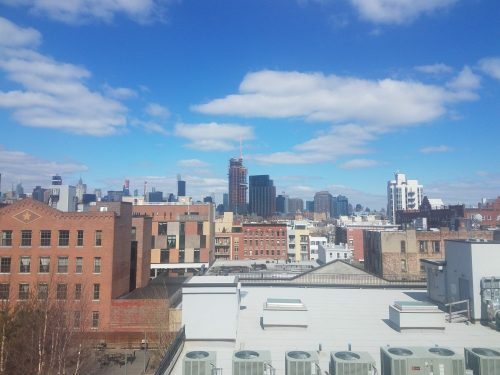 Completed in 1883, the Astral Apartments were unique in their day: Unlike the flimsy tenement buildings that sprang up all around the city without basic amenities, the Astral was a kind of gift to the Greenpoint community and a solidly built showcase. 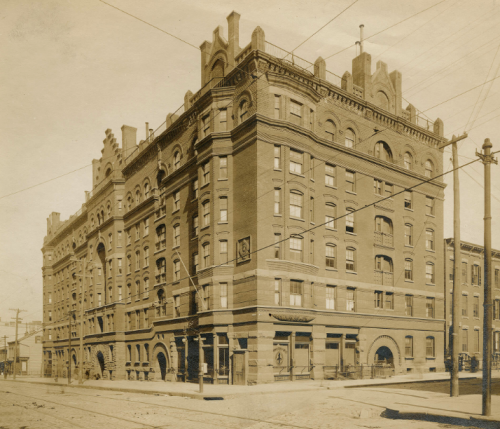 In contrast to tenements, Pratt’s building had plenty of natural light, air and even indoor plumbing, unheard of luxuries for most tenement dwellers. And the building was stunningly beautiful too! The philanthropist hired famed architects Hugh Lamb and Charles A. Rich who also designed his stately Pratt Institute campus. Pratt commissioned them to design the Astral as a model for worker housing. Lamb & Rich based the Astral design on innovative tenement housing built by American philanthropist George Peabody in London who was a personal friend of Pratt’s. Congresswoman Carolyn Maloney is hosting a “State of the District” presentation on Sunday, March 10, at Hunter College W714 (E. 68th Street and Lexington Avenue) from 1:00 p.m. to 2:30 p.m. “Join me at my State of the District presentation this Sunday at 1pm! I’ll be discussing my legislative work in Washington, infrastructure investments in NYC, and the status of ongoing projects in #NY12. 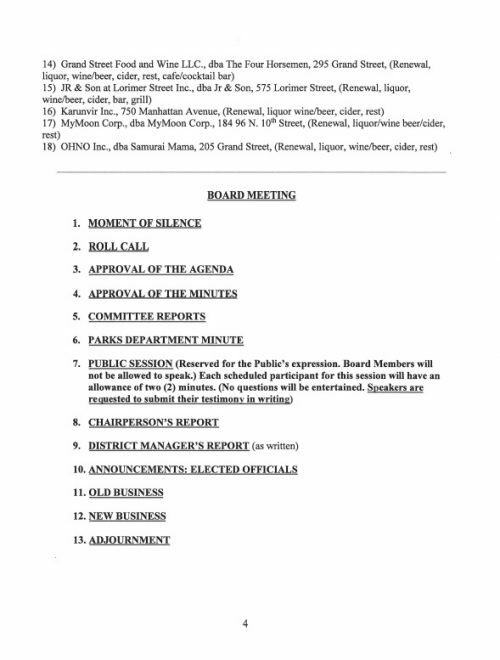 Hope to see you there,” Maloney posted on Facebook. 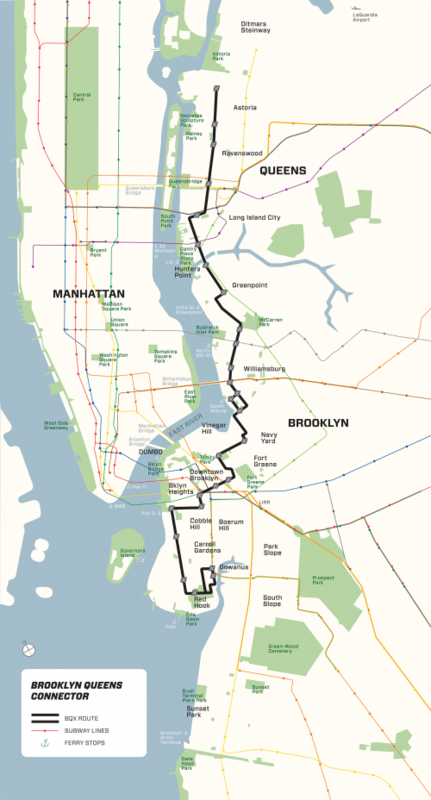 Maloney represents NY’s 12th Congressional District including parts of Williamsburg, Greenpoint, Bushwick, Long Island City, Astoria, the East Village, Midtown East, and the Upper East Side. 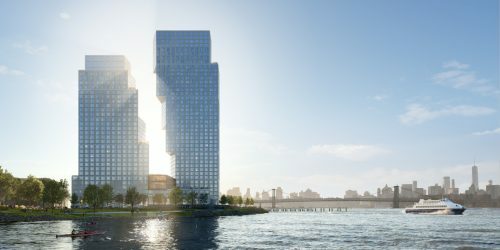 We know the public debate that followed the announcement of the Long Island City project was rough and not very welcoming. Opinions are strong in New York—sometimes strident. We consider it part of the New York charm! But when we commit to a project as important as this, we figure out how to get it done in a way that works for everyone. The iconic industries of North Brooklyn were staffed by females who were underpaid and often worked in dangerous conditions. 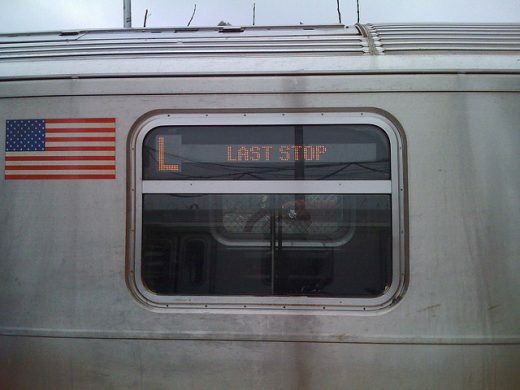 It’s high time we honor these anonymous, but heroic local workers. Some local industries preferred female workers. Why? Well, there are a number of reasons, but more often than not factory owners could underpay female workers, especially immigrant women who often lacked the language skills and awareness to demand their fair wage and better conditions. Some local female workers, however, were anything but docile. 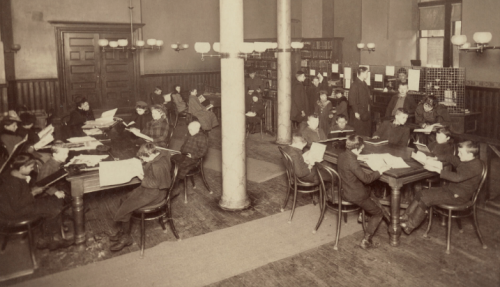 They fought for better wages and better conditions in strikes that often became violent. 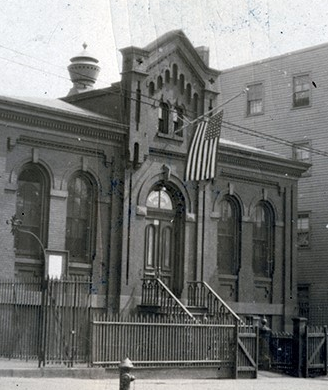 The American Manufacturing Company centered on West Street employed thousands of women, with many from Poland and Lithuanian. They were superior workers to men because the work making ropes required great manual dexterity and female hands outperformed men in making ropes. 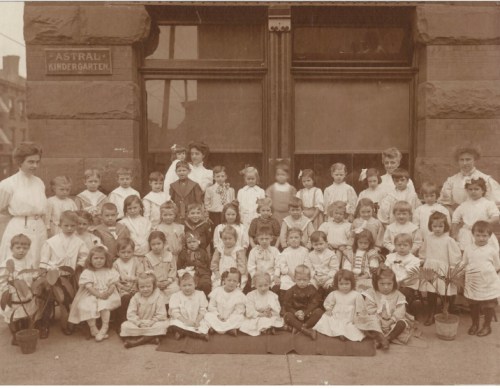 The women worked long hours for poor pay, however, in 1910, the women organized a sit-down strike and engaged in a full-fledged street battle with the local police who tried to prevent them from taking over the sprawling factory. 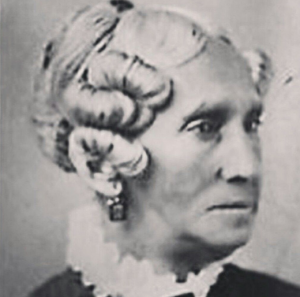 Polish women were also arrested when they violently confronted Italian immigrant workers hired to replace them. 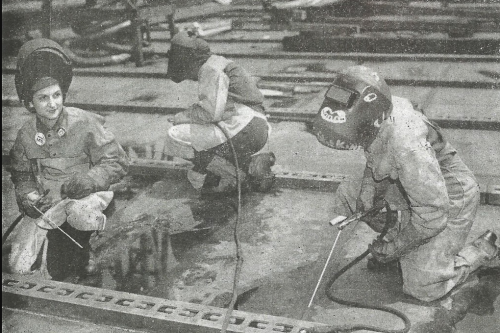 Later Puerto Rican women were brought from their native island to work in the plant, establishing a Puerto Rican presence in our area that lasts until today. Another famous strike occurred at the Leviton plant on Greenpoint Avenue. Leviton manufactured pull-chain lamp holders for Thomas Edison’s newly developed light bulb, and in 1922 the company moved to Greenpoint. The massive factory took up two city blocks between Newel and Jewel Streets and produced over 600 other electrical items, from fuses to socket covers to outlets and switches. 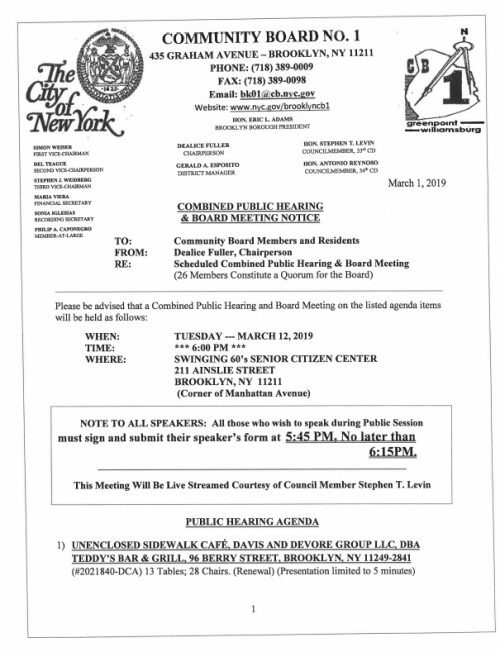 A panel discussion on the proposed Brooklyn Queens Connector (also known as BQX) is scheduled for Tuesday, March 5, at 6 p.m. – 9 p.m. at the Brooklyn Brewery (79 N. 11th St.); the talk is hosted by Friends of the Brooklyn Queens Connector, RSVP here. Brooklyn Borough President Eric Adams will moderate a discussion with small business owners, organizers, and experts from Seattle, Portland, Toronto, Kansas City, and St. Paul. Small group brewery tours begin at 6:00 and 6:30 pm. and the panel discussion starts at 7 p.m. Complimentary food and drinks will be available. 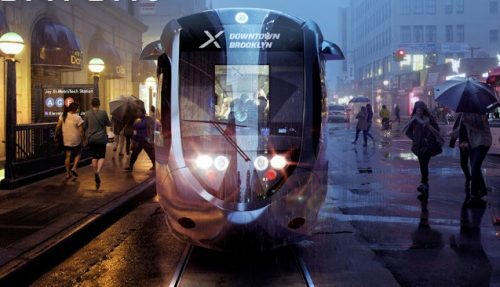 The BQX is a streetcar that would span 11 miles of dedicated lanes from Astoria to Red Hook with stops half a mile apart connecting to nine ferries, 30 buses, and 13 subway lines.